AP ECET Results 2018 @ sche.ap.gov.in/ECET: AP ECET 2018, known as AP Engineering Common Entrance Test-2018 (AP ECET 2018) is conducted on 3nd May 2018 by Jawaharlal Nehru Technological University, Ananthapuramu on behalf of Andhra Pradesh State Council of Higher Education for admission into 2nd year level Lateral Entry into Engineering/Pharmacy Courses for Diploma holders of Engineering & Technology and B.Sc. Candidates for the academic year 2018-19.. Now the candidates who wrote the Engg. Entrance Exam to seek admissions into the second year of B.E./B.Tech & B.Pharmacy in Engg. colleges across the State can wait for ECET Results and Ranks. AP ECET 2018 Rank Cards are very important for attending counseling. The wait of aspirants came to an end now. The AP ECET Results Date is Wednesday i.e., 16th May 2018. AP ECET exams 2018 Results to be declared on 16th May at http://sche.ap.gov.in/ECET. Candidates who have appeared for the exam on May 3nd, 2018 can check the results from the official website . The ECET 2018 exam was conducted to select students admission into 2nd year level Lateral Entry into Engineering/Pharmacy Courses for Diploma holders of Engineering & Technology and B.Sc. in various recognized institutions in the state. Jawaharlal Nehru Technological University, Ananthapuramu conducted the paper on behalf of the APSCHE. Browse for "AP ECET Results 2018" Link. 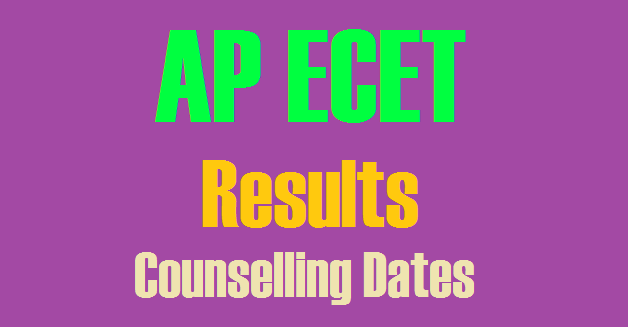 Your AP ECET results are displayed. #AP ECET 2018 Admissions Phase I Counselling Schedule. The qualifying percentage marks for obtaining a rank in APECET -2018 is 25% of the aggregate marks in the four subjects (three subjects for B.Sc. Mathematics) i.e., 50 marks out of a total of 200. However, in the case of SC/ST candidates, there shall be no minimum qualifying marks for ranking the candidates. The rank obtained with the benefit of relaxation of the minimum qualifying marks at the APECET [FDH & B.Sc. (Mathematics)]-2018 by any candidate claiming to belong to SC/ST category will be cancelled in case the claim is found to be invalid at the time of admission. First of all, Download AP ECET 2018 Rank Card from below links. Check the Dates of counseling as per rank. Then attend the Counselling. The Registration Fee receipt will contain the registration ID and Password.So, keep the receipt safe to keep web options. AP ECET is conducted by Jawaharlal Nehru Technological University, Anantapur On behalf of APSCHE. It is conducted as an Entrance exam to offer admission for Diploma Holders in the State to the second year of B.E./B.Tech & B.Pharmacy in Engg. colleges. This exam is conducted for B.Sc (Mathematics) degree holders also . AP ECET 2018 Hall Ticket is the very important form required to attend thee exam hall.